When I went back to school to get my RN degree, I was really worried about getting back into the swing of school things, studying, and the like. I quickly found out that I would be just fine, but when I started the nursing program, it was another whole kind of hard. Rather than just using the memorization techniques I had previously used, I now had to know the material inside and out and be able to apply it to lots of different situations. I didn’t do so hot on the first couple of tests, but eventually got smarter about studying–Mostly in part to this wonderful lady! Meet Carolyn! Throughout the last two years, I’ve met with her almost weekly with a group of my peers to study for our nursing exams. I’m very lucky that the college that I attended (yes! I’m done) offered a wonderful resource called the Learning Center. Students are able to go there free of charge and get help in a variety of subjects–including nursing! When I started the program, Kalissa said that if I was going to do it, I needed to meet Carolyn and I’m so glad she actually marched me over and made me meet her. When we got together with Carolyn for our study groups, she would review any information that was iffy or that we didnt’ understand. She’d reexplain and sometimes reteach the majority of the unit. She always had a ton of extra questions, diagrams, and other wonderful information to share with us to help us learn the material. Needless to say, she’s one of the major reasons I have been able to complete the program successfully. Throughout the past two years though, Carolyn has been more than a tutor for me. She’s listened when I was frustrated, provided me with Kleenexes and candy when I was crying because I didn’t think I was going to make it, and congratulated me when I was successful. She’s been a great friend and mentor to me. It’s people like Carolyn that make me extremely proud to continue on my journey as a nurse. To commemorate her greatness and wonderfullness, I decided to gift her with a quilt on one of the last days we met with her. I chose Easy Street which was a previous Bonnie Hunter mystery quilt as she didn’t quite make nursing school easy, but she surely made it easier! I told her that there was one stipulation though–She had to use it! And from what I hear, her husband is holding her to that! Our class also gifted her with a beautiful bouquet to thank her for her outstanding help and guidance the past two years. 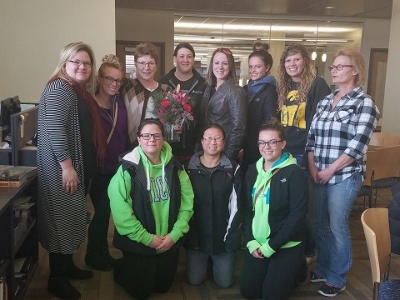 Northeast Iowa Community College past, present, and future nursing students are extremely lucky to have you Carolyn! You are truly a backbone of the program with your vast knowledge and wonderful, helpful personality! Thank you sooo much! You’ve helped me more than you’ll ever know! This entry was posted in Uncategorized on December 14, 2016 by Kelli. Congratulations!! This is a great story! So nice of you to give that quilt! Best wishes on your journey as a nurse! I feel very strongly that nurses are such an integral part of receiving good care. I think even more important than the doctor at times!! What a wonderful tribute. Congrats, Kelli! Kelli, what a beautiful story. Congrats!!! Kelli, congratulations on your big accomplishment! Your hard work and determination paid off!! I’m happy you had Carolyn as a very special friend and mentor…bless her! 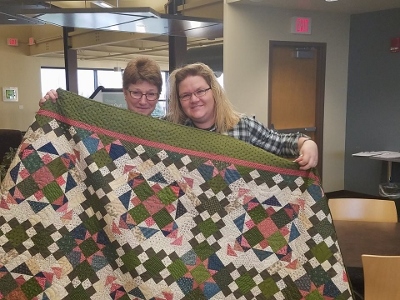 Your quilt is gorgeous and I’m sure she was thrilled to receive it! That is so funny to me about birthdays in December. But enjoy your birthday, Princess Jo!!!! Congratulations Kelli! So glad you had Carolyn to help you and others. The quilt is beautiful! As a retired nurse….Kelli, thank you for your perseverance. Carolyn, thank you for your guidance. Nursing is a great profession and very rewarding. It’s also a demanding profession. Thank you for doing this! As my generation retires we need new and good nurses to carry on. Kelli, what a wonderful gift for Carolyn! And Carolyn, use it! Wrap yourself in love and gratitude. That is awesome, Kelli! What a great gift to show your appreciation to Carolyn. Congratulations on getting your degree.